Phamie has been commissioned to write for a few theatre productions, including The Winter’s Tale, Pilot, and The Infamous Brothers Davenport which had a run of shows at the Royal Lyceum, The Citizen’s Theatre, and Eden Court. 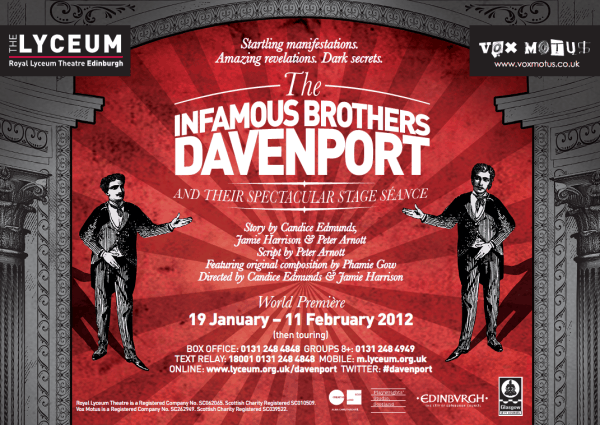 Phamie was commissioned by Vox Motus theatre company (www.voxmotus.co.uk/) and the Royal Lyceum of Edinburgh to score the sound track and musically direct their forthcoming play ‘THE INFAMOUS BROTHERS DAVENPORT and their Spectacular Stage Seance’. STARTLING MANIFESTATIONS. AMAZING REVELATIONS. DARK SECRETS. It is 1862 and the gaslights are flickering… Welcome to an evening of magic and illusion with the infamous brothers, Willy and Ira Davenport. Inspired by the true story of the Davenport Brothers, this amazing play promises to be a true theatrical treat. Join us to witness the wonder and mystery of the Davenports’ dramatic demonstrations. In their presence, furniture dances, bodies levitate and the voices of the dead resonate through the theatre. Discover the dark undercurrent to their Victorian world as the showmanship and drama of the brothers’ onstage presence contrasts with their cruel and curious childhood. Vox Motus creates highly original, vibrant and visual theatre – this is their first collaboration with the Lyceum. Please note that this show is recommended for ages 14+ due to strong language and adult content. After the run at the Lyceum this production will tour around Scotland.